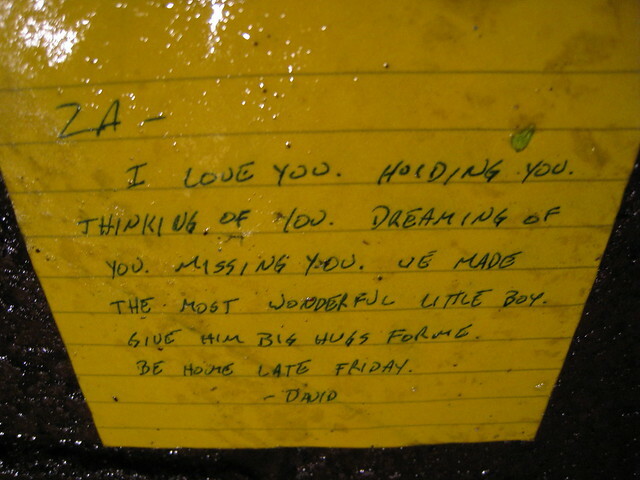 A few years ago, I was walking in the rain down a corridor between the parking garage and a building here in Santa Cruz, when I found this note and took a picture. Almost an intrusion into a private moment between two people to not only read but document, it’s become something I have always been so very grateful to have experienced. It has inspired me to know that type and intensity of love for a partnership and parenthood exists in this world. Thank you Za and David, where ever you are, for unintentionally helping me believe in love…and I hope that your love and family has continued to thrive. I only hope to find something even remotely as beautiful for my future. This entry was posted in Things I Love... and tagged flickr, photography, picture, things i love. Bookmark the permalink.